For most of us, cemeteries themselves symbolize death, though not by design (drive by a cemetery and try not to think about death!). Its just that somewhere long ago, people decided to put all the bodies in one spot, and hence we have the constant reminder of death, the cemetery. As if cemeteries haven’t enough memento mori, cemeteries have come to be replete with symbolism. This is not surprising, as Western society appears to be much more fascinated with death than with the afterlife (a quick scan of popular music and literature should make this plainly evident). In one place we are presented with historical, religious, architectural, genealogical, demographical, and sociological manifestations of society’s desire to memorialize the dead. We’re all familiar with such symbols as the Star of David, and variations of the cross, but what about broken trees and wolf tables, i.e., symbols of death rather than the afterlife? In this article we’ll have a look at some common and some not-so-common symbols, all associated with letting go. So let’s first look at Mortality, that’s the big one. Much like the Grim Reaper, Father Time is often depicted with a sickle or scythe. Will this mythical personification of time use the instrument to cut us down in our prime? No. Father Time had his origin as Saturn, the Roman Deity of Time and an ancient Italian Corn God known as the Sower (the Greeks referred to him as Cronus or Kronos). Male ruler of the Roman Gods before Jupiter, Saturn’s weapon was a scythe. The Roman holiday of Saturnalia was a celebration of the harvest, hence the scythe. It was not until the Middle Ages that the Grim Reaper depictions familiar to us came into being.Father Time’s old, bent body reminds us that time is the devourer of all things and that, like the sand in the hourglass, his physical vitality will eventually run out -as will ours.In the image “Father Time,” atop a Masonic monument in Queens, NY, the sculptor seems to have taken liberties with symbolism. Angel wings? Your guess is as good as mine. Letting the imagination soar is not an uncommon thing in funerary sculpture. It is the one place where sculptors and architects are not required to follow any one particular style. As long as we’re on the subject of time, let’s look at one of its symbols–the hourglass. In addition to actually being used as a timekeeping device, the hourglass in the mourning arts conjures the notion of time’s passing and the inevitability of death. Again, time flies, as seen on this cemetery gate emblem (Woodlands Cemetery, Philadelphia). One of the most amazing funerary sculptures I’ve ever seen is on the rear gatehouse of Baltimore’s Louden Park Cemetery-a huge hundred-plus-year-old wooden carving depicting the hourglass with wings. An hourglass indicates the person’s time on earth ran out and suggests that we should embrace life because it, much like the flow of the sand in an hourglass, is finite and will eventually end. Other funerary symbols that essentially say the same thing are the cut tree and the broken pillar. Another example of the hourglass is depicted above crossed bones, on this stone in an old Quaker churchyard cemetery in Philadelphia. Both symbols are of rudimentary design and therefore were easy to carve. Crossed bones remind us that our earthly bodies will someday die. According to Wikipedia, actual skulls and bones were long used to mark the entrances to Spanish cemeteries. The practice, dating back to the 1700s, led to the symbol eventually becoming associated with the concept of death. 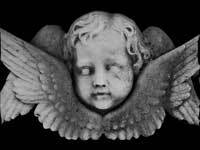 It is interesting to note how the skull and crossbones (depicted on headstones in the 1700s) evolved into the cherub head with wings by the mid-1800s. The change is coincident with society’s changing (i.e., less terrifying) attitudes toward death. Most plants and trees in cemetery ornamentation symbolize the positive, goodness, the afterlife. My father used to refer to death as “pushing up daisies,” a happy notion. The willow, however, is one of the few plants that is plainly indicative of sorrow and mourning. “Nature’s lament,” is how the weeping willow is referred to in Rochester’s Glossary of Victorian Cemetery Symbolism, but why this association with death? Well, cemetery trees in general have a mystique about them. Edgar Lee Masters, in his “Spoon River Anthology” writes how people “…move into the soil and into the flesh of the tree, and into the living epitaphs…” As for the willow itself, Greek mythology has it that the sorceress Circe had a cemetery planted with willow trees dedicated to Hecate (perceived for the most part as the goddess of witchcraft or evil) and her magic. Here men’s corpses were left exposed in the tops of the trees for the birds and elements to devour. From this association with grief and death came the practice of placing willow branches inside coffins, and the planting of young saplings on graves of the departed. According to the Wiccans, the ancient Celts believed that the spirit of the dead would rise up into the sapling planted above, which would grow and retain the essence of the departed person. Truth be told, you don’t generally see the willow carved onto tombstones after the 1850s. Prior to that it appeared to be a fairly common symbol. This tattoo belongs to a member of the AGS, Association for Gravestone Studies.